Breakfast dishes in China widely differ from region to region. 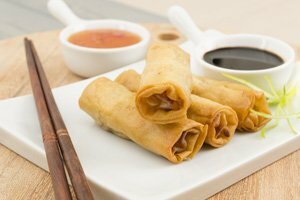 Chinese people usually eat soybean milk and deep-fried dough sticks, steamed buns, tofu pudding, wheat noodles, or rice noodles for breakfast. 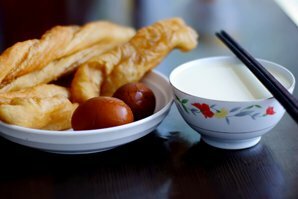 Here we introduce some traditional, popular, and famous Chinese breakfast foods. These dishes are readily found in snack streets every morning (take cash). This breakfast set usually appears together. The two components are the most common breakfast combination. Some locals also like to have deep-fried dough sticks with rice congee. Soybean milk is made with a blender. You can find freshly blended or boiled soy milk in disposable cups at most breakfast stalls. It&apos;s very convenient for a take-out. Deep-fried dough sticks are long, brown, deep-fried sticks of dough. You can eat one as it is or dip it in some soybean milk, which has a better taste. Chinese people eat steamed buns at any meal, but they are especially popular at breakfast. There is an almost endless variety of flavors, both salty and sweet. Salty flavored buns are stuffed with ground pork, eggplant, eggs, and vegetables, such as chives. Sweet flavored buns are stuffed with bean paste, creamy custard, sesame seeds, and sugar. They are also very convenient for a take-out. Stores can sell steamed buns separately. Usually, two buns for breakfast are enough. Some stores sell steamed buns in a small basket with about eight small steamed buns in it. The price will be about 10 yuan for one basket. These steamed buns are usually called &apos;small basket buns&apos; (小笼包 , xiǎolóngbāo /sshyaoww-long-baoww/). Learn more about Chinese Steamed Stuffed Buns . 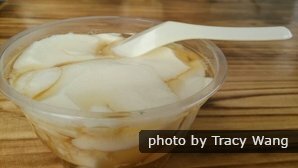 Tofu pudding is a popular Chinese snack made with very soft tofu, which is made from raw beans. Flavors of tofu pudding vary by region. In the north, people like to have salty tofu pudding with soy sauce or salt, or with meat. However, in the south, people prefer the sweet version with ginger and brown sugar syrup. In northern China, where wheat is more commonly eaten, a bowl of hot and flavorful wheat noodles is a popular breakfast dish. 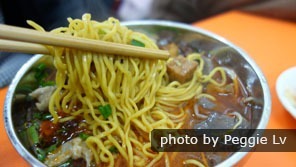 In Wuhan, hot-and-dry noodles are eaten at breakfast by almost everyone. This dish is prepared by frying boiled noodles, drying them, then scalding them quickly and adding spicy condiments. The result is chewy and quite tasty. Lanzhou stretched noodles are a popular halal food in China. The added ingredients are usually beef or lamb. Now, wheat noodle stores have spread to other parts of China, so you can have wheat noodles in nearly every city. See Chinese noodles for more introductions. Rice noodles are a good choice if you are allergic to gluten. They are made of rice although they look like wheat noodles and the taste is different. 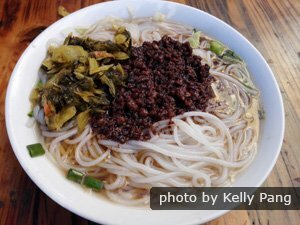 Rice noodles are more commonly eaten in the south, especially in Guangxi and Yunnan provinces. In Guilin, Guilin rice noodles are a very famous and popular cheap meal. Local people eat the dish not just for breakfast, but also for lunch or dinner. This snack is made with boiled rice noodles, fried peanuts or soybeans, thin slices of different meat, chopped scallions, pickled mustard, and other ingredients that you can choose according to your preferences. Rice dumplings are made of steamed glutinous rice wrapped in bamboo leaves. 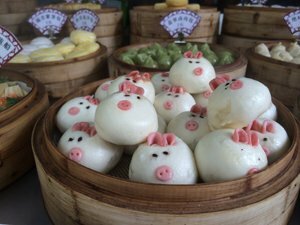 They can be bought at street stalls and have a variety of tasty fillings, including the sweet flavor of red bean paste, egg yolk, and lotus seeds, or the salty flavor of fatty pork and chestnuts. Zongzi are especially popular as a festival food and are frequently eaten during the Dragon Boat Festival. Learn more about Rice Dumplings. Glutinous rice balls don&apos;t need to be wrapped in bamboo leaves. Usually, the vendor will make them for you according to your requirements and tastes. 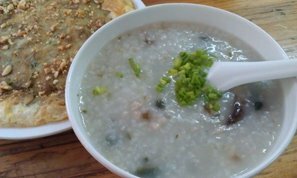 Congee is probably the most common mainstay of the Chinese breakfast. 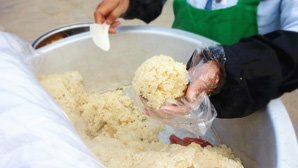 It is a mild-flavored rice porridge that has been cooked for a long time with plenty of water to soften the rice. To give the congee some flavor, it is usually served with different toppings that vary by region, such as pickled vegetables, fermented tofu, peanuts, eggs, and meat. Sometimes congee&apos;s flavor is sweet. Usually, it is made from red beans, coix seeds, peanuts, and black rice. Some find this colorful sweet congee to be so flavorful that it doesn&apos;t require any toppings at all. &apos;Wonton noodles&apos; is one of the most popular breakfast foods in Guangdong Province. 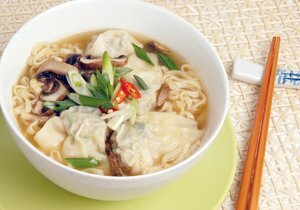 Wontons and dumplings are two similar types of food, which are comprised of a square or round wrapper (a dough skin made of flour and water) and fillings. Wontons can be boiled in a fragrant and watery broth, steamed in a bamboo steamer, or fried in a high-heat wok. Sometimes, wontons are also served with little noodles to make &apos;wonton noodles&apos;. 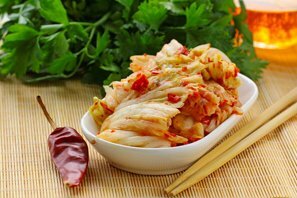 They are available with a large variety of fillings, such as ground pork, shrimp, fish, mushrooms, and other vegetables. The stuffing found in dumplings is similar to that of wontons, and the cooking method is similar too. Learn more about Wontons and Dumplings. These pancakes are quickly-cooked thin pancakes or crepes filled with typically savory or spicy ingredients. As a popular street food in China, they can be easily found and are a favorite "breakfast on the run". 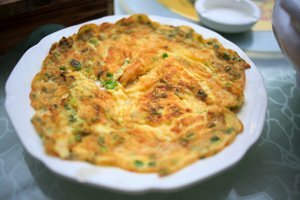 The pancakes are usually wrapped around a deep-fried crispy dough slice and topped with fried egg, finely chopped mustard pickles, scallions, coriander, and a spicy sauce. Morning tea is a traditional custom for breakfast. It&apos;s not a dish, but a name associated with having breakfast. This traditional custom can be found in Chinatowns all over the world. It is extremely popular in southeast Guangdong, Hong Kong, and Macau. The dishes enjoyed with morning tea are called dim sum, and are usually served in a small bowl or basket. They vary from rice to noodles, dumplings, or buns. Tea is also an important element of a traditional dim sum breakfast. Diners may choose from green, oolong, jasmine, chrysanthemum, or other types of tea. In restaurants, customers pick from a large selection of tasty choices, which are served in steamer baskets or on small plates. 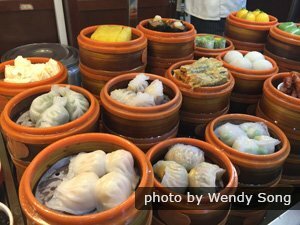 The most popular dishes are steamed vermicelli rolls, shrimp dumplings, and a cup of tea. 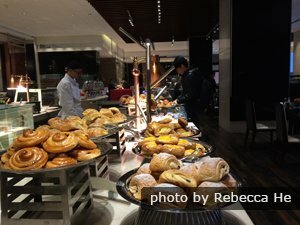 In China, most hotels (except some five-star or four-star hotels) only provide a Chinese-style (buffet) breakfast, with no Western food offered in the morning. 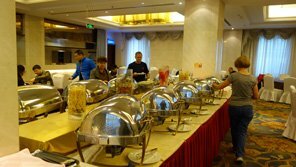 Common breakfast options provided in most hotels are fried rice, fried noodles, ham, pork, pancakes, steamed stuffed buns, congee, boiled eggs, vegetables, and some drinks like milk, soy milk, Coca-Cola, and orange juice. 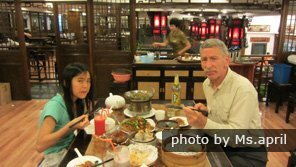 Our customers enjoy authentic Chinese food. China Highlights&apos; tours provide authentic Chinese food. See our popular Chinese food tour below, which combine must-see attractions in China with meals in carefully selected restaurants. See our China food tours for more ideas. Or you can contact us and we can tailor-make a Chinese food tour for you based on your needs and wants.